Yesterday after dinner Tommie and I decided to go hang out in the park. I just happened to have my camera on me and was having a really great hair day so we played photoshoot again! I love photoshoots, I always wished I could be a real model.I should have done pictures before my weekly cheat meal of half a milkshake and cheeseburger (lettuce bun) but oh well, life is short! The park was really pretty and it was about an hour before the sun was setting so lighting was perfect! We lucked out too, not even two hours after this it started raining!!! So about the hair. This is actually Day 1 hair! Usually my day 1 is more fluffy but this is the best day 1 hair I have had in a long time!! Also, the fact that the weather is warmer means I am starting to get more curl definition. I clipped the front section of my hair back as it air dried because the front is unmanageable, so that is why the front if stretched out. I slept with coconut oil on my hair the night before and I used a mix of the Living Proof Restore Shampoo & Pureology Perfect 4 Platinum Shampoo to wash. 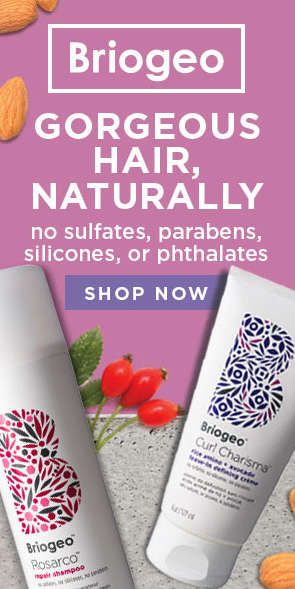 Both of course are sulfate free. I also like mixing in the Ouidad Mediterranean Scalp Treatment once a week to really get a nice clean feeling on my scalp. After shampoo I took a bottle of beer and poured it over my head. Beer rinses help to strength and repair the hair, add great shine and also overall make the hair look better. I rinsed it thoroughly before using conditioner. Thankfully, the terrible beer smell does not linger. I often forget to bring beer into the shower, I have to remember to make this a habit. I personally don't drink beer so my dad gave me the most confused look as I was walking upstairs with a bottle. When I told him my reasoning he said I was wasting his good beer. Oh dad! To condition I used my current new obsession, Briogeo Don't Despair, Repair! hair mask and sat under my huetiful hair steamer for one round of steam. I haven't used my steamer in a few weeks because when I got my hair color done you need to wait at least 10 days to heat or steam because it can interfere with the color. I let the conditioner sit on my hair a while after the steam and then applied Clairol Shimmer Lights conditioner to help fight brassiness. I only leave that on 2 minutes because I don't want my hair to turn purple. After rinsing out the conditioners, as a leave in I used the Briogeo Curl Charisma Conditioner. I really love this Briogeo line, everything I tried has been amazing. This conditioner helps to enhance curl definition and is loaded with incredible ingredients, just like the mask. A little goes a long way too. Continuing to style I used my beloved staples Living Proof Prime and Restore Repair Cream. Followed by a brand new product by Original Moxie called Hold Up Defining Serum! This styling product has strong hold for waves and curls and is enhanced with plant botanicals Quinoa protein. It is supposed to really helped with curl definition in looser hair types like me and also really fight frizz. The best part? IT IS SILICONE FREE!!!!!! This was the first time I tried this styler but I was impressed how not fluffy by day 1 hair was. A full review video and post will be coming once I play with it more. I finally sealed the hair with argan oil before air drying. I really like how shiny and soft my hair was and I did notice less frizz than usual. Even today as I type this on my day 2 hair my curls are defined, still shiny and still not so much frizz! Frizz is one of my biggest hair complaints, especially in Summer. I plan on doing a Summer tips and favorite frizz fighter video soon, I have a good feeling based on first impressions the Hold Up serum will make it on that list! While the camera was out we also took a length check picture, since it has been a few weeks since our last one. Truthfully, I have not had a trim since the first week of February and it's nearing time to go get one. I will have to force myself to trim next hair color appointment the end of June. But I still can't believe the length I am achieving, especially for coloring my hair! It is proof consistent care and patience pays off. I feel like I am slowly getting Mermaid hair. ;) Even the hygienist at the dentist the other day told me I looked like a Mermaid and it made my whole day. I hope you enjoy my photo shoot posts as much as I like taking them. Big thanks to my amazing boyfriend for putting up with me and always taking my pics despite thinking I am crazy. How cute is this mini water fall!? Tommie caught a turtle in this stream once! A few weeks ago Mally had a set of lippies on QVC I just could not pass up! It was a set of 4 of her Evercolor Melted Lipsticks for $50 plus free shipping! At the time I also had a $20 QVC gift card so ordering them was a no brainer. Two of these usually sell for $38. I have been wanting to try this lip formula from Mally for a long time now. 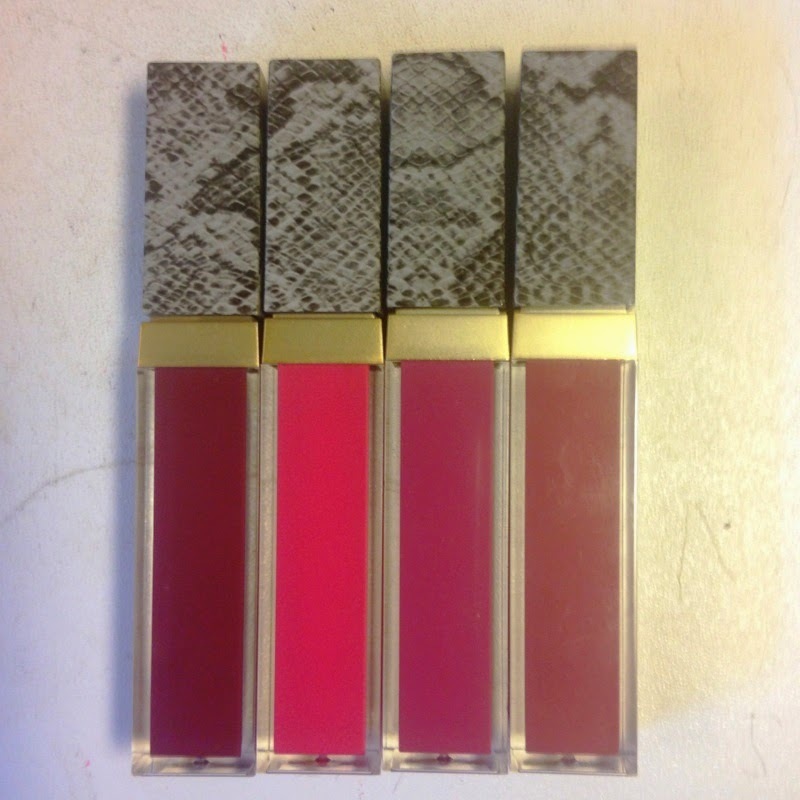 I really love her lip products These are a hybrid formula of a lipstick, lip gloss, lip primer and lip stain in one! You get a nice wardrobe of colors and they are perfect for this time of year. Now that it is summer, I have to be careful with what lipsticks I carry around because I don't want them melting in the heat and since they are already liquid I can stay worry free! This formula is not sticky or tacky and all four colors are very richly pigmented. I find that the darker colors stain longer than the lighter ones but all of them seem to stay on my lips for a minimum of three hours. Of course of the four colors, my favorite is "Pretty Pink" but I enjoy them all. "Mulberry" is a bit too dark for me to begin with, I might reach for it more in Winter but it leaves a lighter, gorgeous stain behind. Finally "Punch" is a nice coral pink and "Mally Mauve" is a very pretty rose. Disclaimer: the products in this video were purchased with my own money. I am not endorsed or sponsored by any company and receive no monetary compensation for my reviews. All opinions and words stated are my own truthful thoughts, as always. 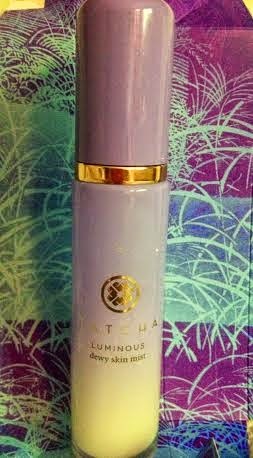 A few months ago I did a first impressions on some Tatcha products. If you missed it you can read about it here. Well here I am back to give an update full review of the Pure Camellia Cleansing OIl and the Luminous Dewy Skin Mist! I really adore this company as a whole. Everyone I have spoken to who works for Tatcha are nothing short of wonderful, the customer service is A+ and the products seriously are some of the best I ever tried out there! I have been faithfully using the Pure Camellia Cleansing Oil every single night since I received it. I use it on dry skin, add some water to make it milky and then use my Clarisonic. A little goes a long way. On days I might not have eye makeup on I use one pump and then when I want to remove my eye makeup I use one additional pump. This cleansing oil has left my skin so very soft and smooth and I really love how it rids my face of everything, including waterproof mascara which cleansing oils I have tried in the past have failed to do. This is a staple in skincare routine now and I don't want to be without it!!! The Luminous Dewy Skin Mist is an amazing Multi Tasker Product! The bottle of the product is absolutely stunning, pictures don't even do it justice. I feel so elegant every time I take it out to spray my face. This mist is very moisturizing and does not contain a lot of alcohol like most toners and face mists usually do. It is infused with Red Agae which is what helps not only moisturize, but almost plump the skin and give it a nice, natural glow. I use using this at night after I cleanse my face but before all my other products as a toner to prep the skin and also receive the additional moisturizing benefits. The mist is very fine and lightweight. I will also use this as a mid day refresher if I am feeling too hot or if I want to refresh my makeup. It INSTANTLY provides me with a natural radiance. Just like the cleansing oil, a little bit goes a long way with this mist.Also, this smells incredible. I can't exactly pinpoint the scent but is natural and very soothing. I love it. Disclaimer: these products were purchased with my own money & also provided to me by the company. I am not endorsed or sponsored by any company and receive no monetary compensation for my reviews. All opinions and words stated are my own truthful thoughts, as always. Technically this is hair of the other day. These were taken on Tuesday, day 2 of my hair wash cycle. Now that Summer is finally here, my curly waves are becoming more defined again!! Humidity helps my hair become more defined, sadly is also brings along an unwanted case of frizz. It wasn't as noticeable in these pics as is not that it is day 4 while I type. But I will have a top frizz fighter favorite video for you guys in the near future so stay tuned for that! Day 1 was a bit different than usual. I actually washed my hair at my boyfriend's house and he lives in a different state (NJ vs NY) but still different water area and other factors, I wasn't sure how well my hair was going to turn out. The other thing is, I love leaving me deep conditioners in for up to an hour to really penetrate and such and then rinse it out. Well, it was Memorial Day and there was no time for that so I actually used a regular purple conditioner (to fight brassiness) in the shower to detangle, rinsed it and then used the Living Proof Restore Mask Treatment as a leave in conditioner & also in place of the Living Proof Restore Targeted Repair Cream I usually use as a styler. My hair came out better than I was expecting! Other stylers I used after shower were Living Proof Prime, Devacurl B'Leave In, ArcAngel Gel & pure argan oil.Then I air dried, as usual. Also, since it is nice and warm out I sneak outside (wearing SPF of course) because the warm air and sun helps speed dry my hair a little bit. Just make sure if you do this you spray a UV protector spray!! I like the Living Proof Restore Revitalizing Spray or Ouidad Sun Shield. I am really getting so excited with how long my hair seems to finally be growing! I do really need a trim. I should have trimmed it when I went for my color a few weeks ago but my hair stylist said we can wait until next time so I did! Also because I said I have been typing today and it is Day 4 I just snapped a quick pic today too. Remember, this is day 4 hair that has been through 3 workouts and a bunch of dry shampoo & refresher sprays! Also half the day I had my hair clipped back half up, half down. I decided to take it down to see how it's been holding up and really I don't think it is the worst thing in the world. I also like the change on my the top got a bit more smooth and then the curls at the bottm for the most part stayed pretty. I will be coconut oiling overnight and then washing my hair tomorrow. Will try hard to take some day 1 hair pics for you guys! I don't know exactly what it is about long hair that makes me love it so much. I have coveted it my whole life. Several times in the past I managed to get my hair pretty long, but due to the constant abuse of flat irons, blow driers and not handling it well, my hair would always get so damaged and break off. And then there were the times I would be growing my hair out only to have an untrusted hair stylist not understand the definition of a "trim" or "dusting" I am sure many can relate an inch to us curly girls and an inch to some hairdressers is just not the name amount, right? For over two years now I have been growing my hair out as healthy as it can be. I even document my hair growth journey in a video series, showing the length and stating any different methods or products I discovered. If you want long and healthy hair, the following are some of my best tips and tricks I have come across. You will see a lot of my tips here are about the overall health of the hair and how to prevent breakage. Often the issue isn't the hair growing from the scalp that makes length difficult to achieve, but the breaking from the bottom that is wreaking havoc on the long hair growing process. CLICK HERE to read my article on NaturallCurly.com with 16 tips that helped my hair growth journey! At the Beach! How to Care for Your Curly Wavy Hair!!! It is FINALLY Summer and BEACH SEASON!!!!! I couldn't be more excited, I love the beach so much. 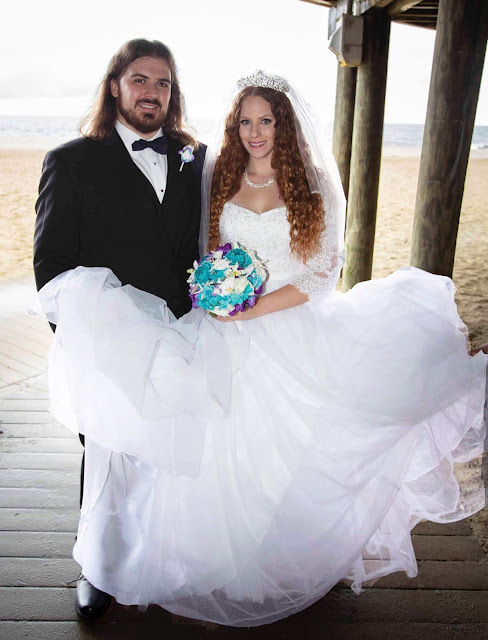 it is sooo VERY important to take proper care of your curly and wavy hair at the beach. You do not want months of care and progress to g to waste in just a few hours. 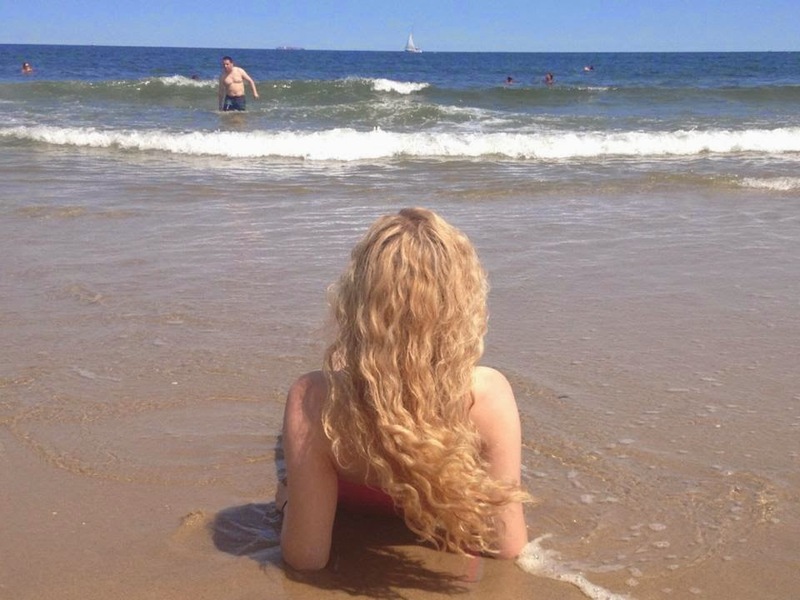 The sun, wind, and salt water can truly damage your hair if you aren't careful. 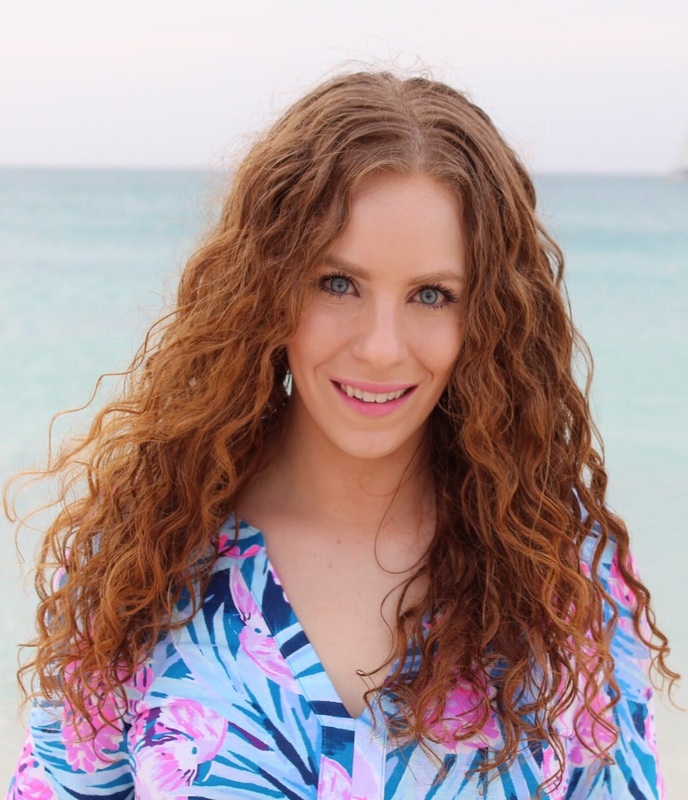 Check out this video I did last summer, talking about all my tips for curly wavy hair care at the beach! And don't forget to wear sunscreen to protect your skin too. Recently, gorgeous actress mentioned how she is starting to emrace her natural curls again to be a good role model for her daughter. After seeing this article, Glenda Cooper from the Telegraph posted this article in response stating how unlike Nicole, she will never love her own naturally curly hair. Check out the article I did for NaturallyCurly.com responding to Ms. Cooper, hopefully getting her to reconsider and helping her along by providing tips for not only her but to hopefully help anyone love their own curls! I guess we can also consider it a curly guide 101? So I honestly thought I did a blog post to go with this video already! Recently I did a hair tutorial video taking you through my hair wash routine cycle and demoing what I do to my hair to style it after shower on wash day (day 1), then on day 2 and day 3. I find my Day 1 hair is always a bit more "fluffy" and big, day 2 is my favorite- "near perfect" hair and day 3 is also really defined. The good thing is with the products I use, because they are Curly Girl Method approved and do not cause a lot of buildup, they don't weigh my hair down in a bad way or get heavy after all the days. Sometimes if I am in a rush, I am not so elaborate with day 2 and/or 3 and sometimes I do occasionally wind up with nice day 4 hair also! My Favorite IT Cosmetics Products! 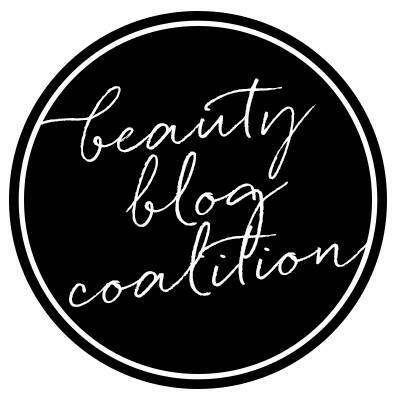 We both love the brand and originally we were going to pick our top 5 favorite products each. Well, choosing only 5 was IMPOSSIBLE- so I went with my top 10 or so. Tarte Cosmetics Pink LipSurgence Set on QVC Today!! If you missed out on the second shipment of the Tarte Bow & Go kit, or if you are crazy like me and love pink lippies and so badly wanted backups, Tarte put the 4 Lipsurgence Lip Cremes from the set on QVC alone today!!! Of course I HAD to order a second set. I am obsessed with pink lippies and especially love "Patien" and "Devoted". Click here to shop for the set! I really am enjoying how my makeup came out today. It is simple, but with a pop of color perfect for this GORGEOUS Spring day! On my eyes I primed with the tarte amazonian clay eyeshadow primer (discontinued. but their clean slate eyeshadow primer is equally amazing) and then used the Mally Beauty shadow in "pop art blue" on the lid and a little into the crease and the Laura Geller "Sugar Glow" highlighter under the brow bone. Liquid liner is by Kat Von D- I don't even know the name of it or when I bought it to be honest! But I like that I am able to make a thin line with it. Mascara is Tarte Multipleye Lash Primer, Kat Von D Immortal Lash Mascara mixed w/the Josie Maran Argan Mascara. On my lips is the Mally Beauty Perfois Pink Lip System in "Soft Pink" I love these lip sets. There are 3 in total: Soft Pink, Classic Pink & Bright Pink. I own all three and use them for different occasions. Each comes with it's own lip liner, lipstick and high shine liquid lipstick! Of course I would love these, it's me and it's pink lips. Face wise I have on the Tarte BB tinted Primer in Medium which is a touch too dark right now but I used the BareMinerals Bare Skin Foundation in "Shell" on top of it which is a bit too light for me. Blending well helped to achieve a great color. I usually mix the Medium Tarte BB Primer with the Light but I am dangerous low on the Light and trying to hold off for a tarte friends & family sale. The lady in Sephora color matched me a sample of the Bare Skin foundation. I thought I should have been darker but she swore that would be my shade. It gives a nice finish- full coverage, radiance but not overly dewy but it does seem to settle a bit into my fine lines. I have it as a sample and am iffy about going with the full size. Tarte Cheek Stain in "Flush" on the cheeks topped off with the Amazonian Clay Blush also in "flush". I contoured using the Tarte Sculptor Stick. That product is GENIUS and amazing. I'm addicted to it for easy breezy contouring! Tarte Brow Architect for my brows was used. Finally I set everything with the Mally Un-Diamond Powder and then Face Defender. Tarte Cosmetics released a beautiful tropical themed palette with their Summer 2013 collection called "Golden Days & Sultry Nights". It contains five new shades of the Amazonian Clay powdered eyeshadows. I love the cover of the palette- so bright and summer like. I actually purchased it when there was a promo going on tarte's website to get a free matching scarf!! The colors of the shadows are very pretty. Two mattes, two shimmers and one glitter. They all had excellent color pay off to me except for the gold shade which sadly, was very hard to pick up. 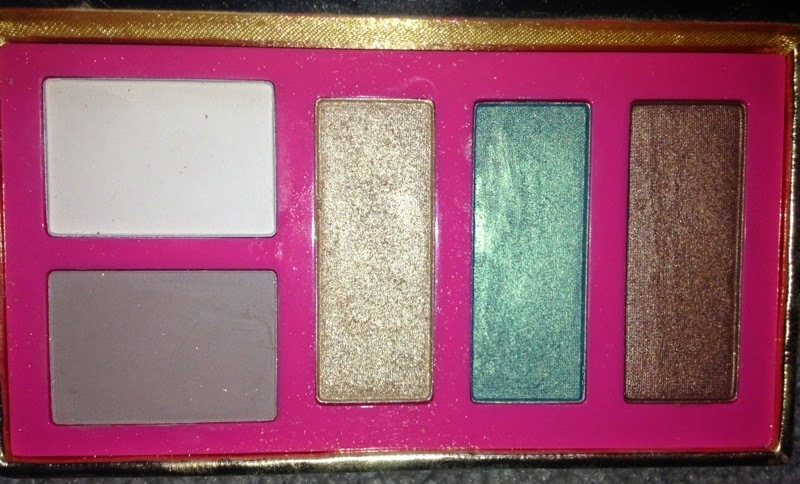 This palette may remind you of the Aqualillies palette from Summer 2013 and the exotic eyes eyeshadow palette. When I first saw this new palette, both of them came to mind. But it is indeed different as you will see in the video below when I compare the shades. Also make sure to see my video for a full review, swatches and a demo showing how easy and wearable that turquoise blue color is! Disclaimer: the products in this blog were purchased with my own money. I am not endorsed or sponsored by any company and receive no monetary compensation for my reviews. All opinions and words stated are my own truthful thoughts, as always. Here are my May unboxing videos for Birchbox & Ipsy! Read & Watch My NaturallyCurly.com Guru TAG!